In 1860, Reverend Ashburn, believed to be a circuit-rider preacher, organized the first Methodist Church at a site on the west side of the road to Brownsboro, just short of the top of the first hill south of today's downtown Edom. Over the next 60 years a small church was built and many outdoor revivals were held under temporary brush arbors. The Methodist Episcopal Church, South, of Edom is believed to have been founded as early as 1859. Under the pastoral leadership of Reverend D.L. Lake, this church was officially organized in 1874. While much of the church’s early record keeping from 1860 to 1895 has been lost, we know that the first recorded member in 1895 was M. Ozema Vinson, who came by letter from Neblow, Alabama. 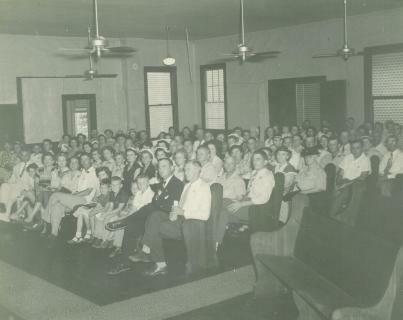 Many have since found connection to God and each other at Edom United Methodist Church. In the early 1920’s the church moved from its original site to its present location. Beginning in 1923, the church occupied a frame building at the present site; cooled by overhead fans and heated by a single pot -belly stove. 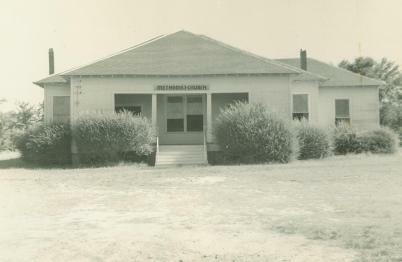 After World War II, the members longed for a new building, and by the early 1950's some members were dedicating cash proceeds from the sale of special livestock and crops to a building fund. Led by Rev. A. Jack Adrian, construction of a new sanctuary began in 1952. But the project that paid for much of that brick sanctuary and classroom space, which is still in use today, was a cooperative, church-wide project in 1953 to plant, raise, harvest and sell a huge crop of sweet potatoes. On February 20, 1955, during the tenure of Rev. R.C. Brock, the new church was dedicated by District Superintendent Dr. Frank Richardson, following remarks by Rev. Jack Adrian. The present parsonage, located immediately east of the church, was constructed in 1964. First occupied by Rev. WG. Nettles, it was dedicated on October 20, 1974 during the tenure of Rev. Jerry House. 1968 brought about the union of The Evangelical United Brethren Church (formerly the Evangelical Church and The United Brethren Church) and the Methodist Church (formerly The Methodist Episcopal Church, The Methodist Protestant Church, and The Methodist Episcopal Church, South). The union of these varying churches became what is today known as The United Methodist Church. In light of the unification of the aforementioned churches, our church was renamed Edom United Methodist Church that same year. Between 1895 and July, 1981, thirty-four ministers served the Edom church. Number thirty-five was Rev. R.C. Terry, 81, a "retired" Methodist minister and former superintendent of both the Palestine and the Houston East Districts of the Texas Annual Conference. During his four years at Edom, Rev. Terry enrolled 19% of all the members recorded in the first 90 years of the church's recorded history, and increased the current membership by 40%. The deluge of new members crowded the church. In November, 1984, during a discussion about buying some new children's chairs, the board expanded its vision and proposed an entire new building wing. Construction began two weeks later with church members having pledged to provide all the funds for materials and to perform the actual labor themselves. Designated as the Terry Fellowship Hall in March, 1985, the new wing was completed and entirely paid for by April 28, only five days before the death of Rev. Terry on May 3, 1985. The wing was dedicated by District Superintendent Dr. Frank Richardson, Jr., the son of the district superintendent who had dedicated the sanctuary 30 years earlier. Edom United Methodist Church continues to be at the heart of the community through Men’s and Women’s mission organizations and a multitude of community services and involvements. With multiple Sunday School classes, a small but active youth group, men’s and women’s ministry areas, Edom United Methodist Church continues to worship and serve, all the while seeking to make disciples of Jesus Christ for the transformation of the world.